An unlikely, but enthusiastic, convert to rock ‘n’ roll after a successful career as a sideman in jazz, Bascomb never had a legitimate hit as a rocker but delivered some memorable sides that remain highly regarded well into the 21st century. Paul Bascomb was born in 1912 in Alabama and while attending college at Alabama State he along with two others founded the Bama State Collegians, a jazz orchestra that somewhat surprisingly became a legitimate national band upon the members graduating and heading to New York in 1934 where they hooked up with Erskine Hawkins who became their leader, the band quickly becoming one of the top aggregations in all of music while recording such legendary songs as “Tuxedo Junction”. By now Paul’s younger brother, Dud, a trumpeter, was part of the group and they’d remain with Hawkins until 1944 when the two went out on their own, recording sides for a few years in a more big band style typical for the time that failed to find the same success as what they had left behind. In 1947 they split their professional relationship and Paul was signed by Manor Records for a session which he cut under a new moniker – Manhattan Paul – either to signify a new stylistic approach, or to give him alternatives in the marketplace for recording and promotional reasons. This music was firmly in the rock vein and while he and his band members were jazz musicians capable of playing a more technically polished style, under Bascomb’s direction they committed themselves to authentically delivering the new form and the results at times were exceedingly good. He continued recording under the Manhattan Paul designation for a number of labels, large and small, and flirted with rock hits without being able to fully break through commercially. Eventually he returned to jazz and remained a highly respected performer. 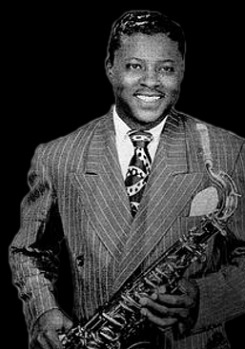 Bascomb was inducted into the Alabama Jazz Hall Of Fame in 1974 and passed away in 1986.